We all know that first impressions count. Having sparkling-clean windows can project a great company image to your clients even before they’ve stepped through the front door, however so many companies miss out on this opportunity by overlooking the effect of their grimy windows and skylights. Don’t think that is the end of it; dirty windows block sunlight from the workplace and can have a negative effect on your staff and customers. 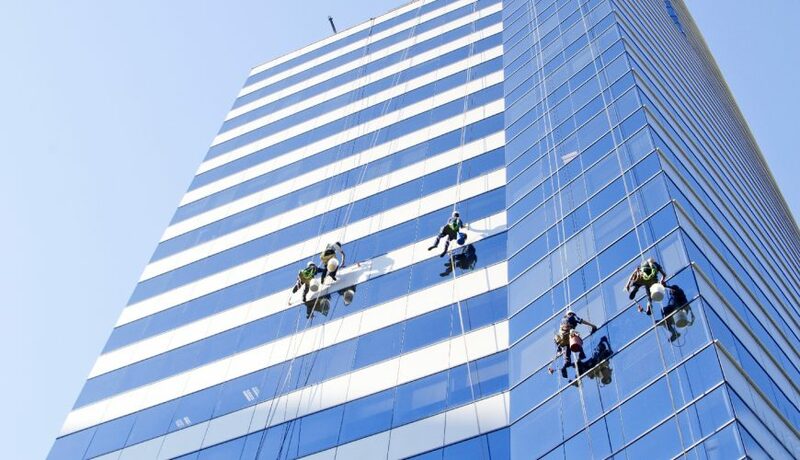 Champion Cleaning Services’ window cleaning service is designed to suit all needs and we can adapt our window cleaning to most commercial requirements. We are proud to be B.I.C.S accredited (The British Institute of Cleaning Science), Construction Line registered, Federation of Window Cleaners certified and SMAS (Safety Management Advisory Scheme) accredited with our window cleaning operatives being enhanced DBS checked and trained to tackle ground level, ladder work, reach and wash systems, abseiling or powered aerial platforms. Additionally, our equipment is regularly tested and checked that it meets all legal requirements, and a strict health and safety code is operated and adhered to by all our operatives. We are proud to say that we currently supply our window cleaning service to schools, government buildings, hospitals, and offices close to our headquarters in Warrington and across the UK. We have earned an excellent reputation for providing a consistently high standard of service and we consider our management expertise and our immediate Senior Management response, to be among the very best around. If you would like to learn more about our superior window cleaning service, please get in touch with us through our Contact Us page or give us a call now on 01925 850657. Champion Cleaning Services will always ensure that a dedicated manager will be allocated to you. That central contact point will always be available to you, whenever you need us. Regular audits are carried out, with client participation, whenever you need.